tight and tuneful"; "While other subwoofers in its price range can go deeper and play louder, the EXP is on the money with solidity and control." Features Phase, level and crossover adjustments; 140 watts of power; small size for easy unnoticed placement; magnetically shielded; "Direct" feature for use with surround-sound receivers. 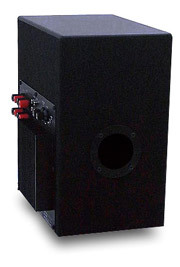 Use Perfect partner for NSM's Model 5 and Model 10S speakers, which benefit greatly from the EXP's low-end augmentation. Value An upgrade option for NSM's small-in-stature speakers -- both visually and sonically. In general, Ive found two things to be true about speakers: Its harder to build a really good inexpensive speaker than a costly one, and (following this logic) the best way to build an inexpensive speaker is to choose compromises wisely and dont try to make the speaker do too much. After all, there is a reason some things cost more than others. NSM Audio builds good inexpensive speakers. The teeny-weenie $385 Model 5 is surprisingly robust-sounding, and it can fit in the palm of your hand! The $995 Model 10S is somewhat larger, but still very small by most standards, and it has a more refined sound that I've described as seductive, sultry, and very smooth. Both these speakers can image holographically, but they are compromised in order to achieve their level of performance. By nature of their size (and price) they are devoid of any real low bass. However, thats not to say they are not satisfying on their own; they most certainly are and will be suitable for many listeners. But if you want to experience some serious low end, its just not there. Enter the EXP subwoofer. Face it -- many people just dont want big speakers, and I dont doubt that one reason NSM chose to make their speakers so small is that they look good at their size. Placed in a room, these speakers simply disappear sonically and visually. Even if you do notice them, you will probably find them attractive in their simple black finish (an optional walnut finish is available too). Its no surprise, then, that the $695 EXP, a subwoofer meant to mate with NSM's small speakers, shares some of these same attributes. The EXP is self-powered (with a 140W amplifier) and comes with cloth clad around its sides and finished end caps made of MDF. Its a smallish enclosure measuring 9.5"W x 14"H x 12"D. There are no unsightly woofer drivers to be seen, and the total weight is quite low, about 25 pounds. NSM has chosen to create a vented enclosure that uses a single 6.5" woofer that fires internally and produces sound from a single port. The EXP is an elegant-looking package thats attractive enough to sit out in the room or neatly tucked away in a corner or near a wall. It's also magnetically shielded, giving you the option of placing it near your TV. NSM backs all their loudspeaker products with a ten-year warranty. Set up in this fashion, the satellite speakers are effectively run full range, while the subwoofer operates only below a certain frequency (the setting chosen on the EXP's crossover control). I like this option because it does not add another crossover in front of the speakers by going through the subwoofer. But there is a down side too. Running the satellites full range means that they still reproduce bass frequencies and are therefore constricted to their own output capability. But in my system and smallish room, this doesnt matter. To get proper integration, the EXP has level and phase adjustments. Of course, there is a crossover, adjustable from 40Hz to 200Hz, to allow you to properly match the EXP to the roll-off point of your main speakers. There is also a feature called "Direct." Its activated with a switch and bypasses the internal crossover and simply plays the incoming signal full range -- or at least as full range as a 6.5" woofer can get. With surround-sound receivers or systems with external crossovers, you will most likely get better performance with the "Direct" switch enabled. This is because the crossover will be handled by the receiver's circuitry and you won't then be "duplicating" this by using the EXP's crossover too. The result in your audio-only system, however, is simply a mess of a match between the EXP and the satellites. On the other hand, 60Hz was the magic number to cross over both the NSM Model 5 and Model 10S speakers. The match proved seamless. Before I go on, I will say that you may also opt to run speaker cables to the EXP from your power amplifier and then another set out to the satellite speakers from the EXP. Or you can run a set of speaker cables from your power amplifier to the speakers, and from the power amplifier to the EXP (providing your binding posts can accommodate a double stack of connectors). I didnt use either of these configurations, so I cannot comment on the sound quality. If you choose this method, keep in mind that you will need two sets of speaker cables (and the other method I used requires an extra set of interconnects). The EXP was used in a system consisting of the Blue Circle BC3000 preamplifier and BC2 mono amplifiers, Theta Digital Prime II DAC and Data Basic transport, Nirvana Audio S-L series interconnects and speaker cables to connect all electronics and speakers, and also DH Labs Silver Sonic BL2 interconnects to connect the EXP to the BC3000. I used NSM's Model 5 and Model 10S speakers along with the EXP. The EXP is dubbed a subwoofer, but this may be stretching the definition. This isnt to criticize the EXP in particular; many companies use term when, in fact, something like bass-extender is probably more accurate. When I think of the word "sub," I think of something that goes down very low -- far below the main speakers' output. In an audio sense, this would be something that hits the limits of human hearing -- 20Hz or lower! The big-woofing units from the likes of Paradigm, Mirage, REL, and B&W, among others, can do this. The EXP, like other smaller subs even from those same companies, will give you realistic extension to about 30Hz or so, which is par for the course given the price. I chose the crossover point of 60Hz for the EXP for two reasons. First, a lower crossover point makes the subwoofer more omnidirectional, meaning you wont be able to aurally locate the subwoofer in the room regardless of where you place it (even to the side, tucked away). Second, it simply sounded best. Anywhere above that frequency seemed to cause a sound that is not easy to describe, but it simply didn't sound right. At 60Hz, the EXP only played the lowest portions of the signal and fit right in as a musical package -- so right, in fact, that the EXP only made everything better. So set up properly, the EXP does nothing to mess up the sound -- the character of both the Model 5 and Model 10S remained unchanged. The EXP simply takes the low road, so to speak, which results in more weight to the sound, along with greater impact, musical ambiance, and room-filling ability. To figure out what it was doing exactly, I would disconnect it while playing music, and the difference was easy to discern. There was solidity and weight that were obviously absent when the EXP was removed or shut off, and this doesnt make things better. The clean, almost sparkling sound of the Model 10S alone does justice to TLCs FanMail [LeFace 73008-26055-2-RE-1]. However, in terms of wallop, fans of hip-hop and dance will not find the 10S all that appealing. Its just too light in the bottom end. The EXP changes all that. For example, "No Scrubbs" has a quick drum beat and bass track, and both keep excellent pace with the lead vocals. Without the EXP, the beat turned to a tight, but light, "thpp, thpp, thpp." Re-inserting the EXP deepened this to a tight and very tuneful "whomp, whomp." Enjoyment improved immensely. Bruce Cockburns vocals on "Pacing the Cage" from The Charity of Night [True North TNSD 0150] have a deep, resonant sound that is firmly fixed in space. Played through the 5 and 10S alone, there is startling clarity and definition, with an image so carved out in space its almost spooky. With EXP in play, the vocals retain the same type of clarity, but there is more presence and spaciousness through the improved resolution of the bottom end. Drums have much better weight and presence, and the room ambiance is conveyed more convincingly. As well, the quality of the bass that the EXP delivers is just like that of the 5 and 10S -- tight and tuneful. This is very important because although some subwoofers (or even just woofers on larger-sized speakers) can go deep, they are sometimes woolly and indistinct. I find that although this too can add weight to the music, it can obscure detail and not be a positive thing. While other subwoofers in its price range can go deeper and play louder, the EXP is on the money with solidity and control and proves ideally matched to NSMs speakers. In fact, with both the NSM 5 and 10S, there was no doubt that things improved all around. Gaining bass extension like that which the EXP offers provides a clearly audible improvement, far more than spending a similar amount of money on cables or the like. There is just no guessing that you may have heard an improvement when the frequency response is obviously extended. As I mentioned, the basic character of the NSM speakers remains unchanged. So if you have a limited budget of, say, $1000, which is better value -- the 5 with the EXP or the 10S alone? Should you go for more bass or more refinement? Frankly, this question is too tough to answer, and really must account for your musical tastes. I would buy the 10S alone, simply because I value refinement over bass extension. Ill forgo the bottom end to get better midrange clarity and a more pristine top-end -- the Model 10S has these over the Model 5. However, there are many not like me who will find the 10S simply too lightweight, and I cant disagree with them. Together, 5/EXP combination can more easily swing through a wider variety of music by nature of its better bass extension. Subjectively it has more output capability (likely because of the bass extension), and the 5 does edge out the 10S in one area: imaging (but keep in mind that theyre both great speakers in this regard). There are also others who will find that $995 is simply too much money for what is essentially a tiny speaker. Thats what helps make the Model 5 such a bargain -- and give the 5 with the EXP the slight advantage. As well, those on severe budgets may opt for the Model 5 now and add the EXP later. Its a good upgrade idea. Regardless of what you choose, NSM offers a nice line of speakers that allow flexibility in terms of price and performance. And the EXP is a fine subwoofer thats an ideal mate for either the NSM Model 5 or Model 10S speakers. If you have the 5 or 10S, you will no doubt want to try the EXP. Its has a tight, tuneful nature, and it will play loud enough for most listeners' tastes. Whats more, with either the 5 or 10S, the EXP makes for an attractive speaker combination thats easy to place in a room. In an age of lifestyle-conscious consumers, systems as flexible as either NSM's Model 5 or Model 10S speakers along with the EXP subwoofer can be very appealing.